Few federal agencies evoke as much emotion in the average American as the U.S. Environmental Protection Agency (EPA). Either directly or indirectly, the agency's operations confront the average person in intimate ways. Everyone wants breathable air, drinkable water, and land free from harmful pollutants on which to live. EPA's actions in pursuit of those goals have altered the nation's social, political, and economic course. Moreover, in attempting over the past quarter century to make a cleaner environment a reality, EPA has found itself regulating the personal conduct of individual citizens. Often, the turbulent relationship between the agency and its diverse constituencies has interfered with these tasks. At various times during its history, the agency has roused business and industry, farmers, environmentalists, Congress, the White House, and the general public to ire. EPA has attempted to regulate the environment by building acceptable compromises among its constituents. Since compromises by their very nature are seldom satisfactory to everyone, EPA's constituents have given the agency mixed evaluations. Still, the agency has continued to follow many of the pollution control strategies set forth by its first administrator, William D. Ruckelshaus. Understanding the course set by Ruckelshaus and his staff illuminates not only EPA's past, but clarifies the agency's place in American society today. Ruckelshaus's original mission appeared simple enough: clean up America. It proved to be deceptively simple. Echoing the naturalists among their ancestors, the environmentalists of the day pointed out that life on earth was intricately interconnected. Still, most Americans did not foresee that actions designed to clean the natural environment and protect public health would alter the economy, foreign policy, race relations, personal freedom, and many other areas of public life. Almost inadvertently, EPA redirected a portion of the nation's energy to reckon with the pollution problem. 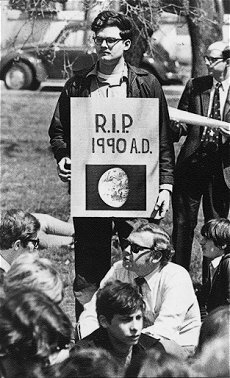 Participant in Earth Day, 1970. The event demonstrated widespread public concern for environmental health and permanence. 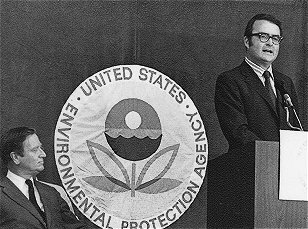 When sworn in as administrator of the new Environmental Protection Agency on December 4, 1970, William D. Ruckelshaus shouldered the massive responsibility of organizing and leading the federal government's most recent effort to protect the American people from the effects of pollution. He approached his task with the optimism and high expectations of someone setting out on a new endeavor. By the end of his initial term in 1973, he could identify with Sisyphus--the ancient Corinthian king forever condemned to pushing a boulder up a hill, only to have it roll down just short of the top. Ruckelshaus and his successors experienced the sisyphus effect every time the American people demanded a healthy and beautiful environment, but expressed uncertainty about the extent to which the federal government should act to achieve those ends. Nevertheless, Ruckelshaus urged his staff to move ahead "with the valuable work which is already underway. We cannot afford," he wrote in his first days in office, "even a slight pause in the ongoing efforts to preserve and improve our environment." 1 His workforce of more than 5,000 represented the bulk of the federal government's previous efforts to discover and regulate threats to the environmental health of the nation. The initial complement consisted of government employees who had staffed a host of environment-related programs housed in the departments of Interior, Agriculture, and Health, Education, and Welfare. The Council on Environmental Quality (CEQ), Atomic Energy Commission and Federal Radiation Council also contributed to the initial EPA staff. At different times, many had been on opposite sides of ideological and environmental policy fences. For example, the Department of Agriculture's pesticide program often worked to thwart the efforts of the Department of Health, Education, and Welfare's pesticide program. Ruckelshaus hoped to turn the diversity of such a staff to his advantage. Son of a prominent family of Indiana lawyers, Ruckelshaus stepped into the new agency with some environmental enforcement experience. After graduating from Harvard Law School in 1960, he returned to Indiana, joined his father's firm, and was appointed deputy state attorney general. His tasks included acting as counsel to the Indiana Board of Health, and in this capacity, he used the courts to stop municipalities and industries from grossly polluting Indiana waterways. He worked with the department's Stream Pollution Board to this end. But, the board possessed limited resources and enforcement powers. Prior to Ruckelshaus's arrival, it used its resources in a very limited manner. He helped reshape the board's strategy. He traversed the state with Jerry Hansler, an assignee from the U.S. Public Health Service, collected samples and photographs from grossly polluted rivers, and then called the responsible polluters before the board. In spite of the governor's fear that pollution enforcement would drive industry from the state, these tactics succeeded largely because the industrial violations of state statutes were so flagrant. Concurrently, he helped draft the 1961 Indiana Air Pollution Control Act, a piece of legislation that along with his water enforcement experiences influenced his early pollution abatement strategy at EPA. With this enforcement background--which convinced him that a centralized enforcement effort was all that was needed to implement pollution control laws fully--Administrator Ruckelshaus set out to establish his new agency's credibility in the mind of the public and the polluters. To do this, he struggled to develop concrete, attainable goals for the agency and to set up a workable organization focused on realizing those goals. The complexity of these tasks shattered his hopes for instant pollution abatement. To organize an agency consisting of an array of offices from different and often competing departments proved daunting. The major ideologies that had historically vied for authority in American society--centralism and federalism--confronted EPA's organizational staff. Competing sectors of American society championed these ideologies. The military favored a highly centralized organizational structure. Military planners had long believed that that centralized decision-making enabled efficient and effective deployment of resources to meet mission objectives. The military's poor showing in Southeast Asia led other analysts to question this assumption. A variety of groups favored a decentralized, or federal, approach. Federalism is the notion that the power of government should be distributed between the national government and state and municipal governments. Historically, arguments arose over how much power should be distributed, and they still do. During the late 1960s, people tired of the escalation of American involvement in Vietnam and big government programs emerging from Lyndon Johnson's "Great Society" program and began advocating reducing the size and scope of the central government. Business groups supported this movement because they wanted the preponderance of regulatory power shifted to the states where they found it easier to outmaneuver or bully state officials into not enforcing regulations. Some environmentalists, who championed ecological regionalism, also supported administrative decentralization. For the first few months, Ruckelshaus and his staff heard advice from many arenas. To many, the ecological ideology underlying environmental activism suggested an intermedium approach to pollution control. That is, instead of one branch of EPA focusing on water pollution, another on air, a third on solid waste, and so forth, regulators would look at the entire pollution problem and attempt to create a holistic solution. For example, regulators would seek solutions that would clean the air without further degrading water or land with extracted pollutants. To this philosophical position, Alain Enthoven, a Defense Department organization analyst, contributed a realistic, mission-oriented approach that had been generally successful in the military bureaucracy. Enthoven suggested a radical departure from traditional, medium-oriented pollution control. By structuring EPA around functional objectives such as criteria setting research and development, and enforcement, the agency could best achieve its mission and at the same time operate with centralized efficiency. Office of Management and Budget staffers and consultants who had served the Ash Council--the work group largely responsible for EPA's creation--recognized the value of Enthoven's approach, but suggested that present realities called for a more moderate, incremental approach to organizing the agency. Consultant Douglas Costle, who had worked with the Ash Council and was later President Jimmy Carter's EPA administrator, played a prominent role in defining EPA's organizational strategy. While serving on the Ash Council, Costle had recognized the merits of the Enthoven approach, but also recognized that existing statutes imposed complex restrictions to integration and centralization. Sensing that Ruckelshaus desired fast action to promote a strong public image of EPA, he submitted plans that integrated the centralizing tendencies of the Enthoven proposals with the medium-specific approach virtually mandated by federal and state pollution control statutes and regulations. Drawing from the social diversity of the 1960s, Costle sought to mount the war on pollution by enlisting the traditional, compartmentalized approach of past pollution control efforts; the ecological ideology espoused by often countercultural environmentalists; and the logistical and organizational expertise of the defense establishment. Drawing heavily on Costle's advice, Ruckelshaus settled on a tripartite reorganization strategy designed to make the agency more efficient by consolidating and streamlining its functions. During the first phase, he retained intact many old-line, medium-specific programs in order to preserve continuity of effort while his management and organization staff sorted through the chaos entailed by thrusting together the diverse and sometimes conflicting functions that comprised EPA (see Figure 1). The first plan created three functional divisions headed by assistant administrators-planning and management, standards, enforcement and general counsel, and research and monitoring. The plan retained five program offices constructed along media and topical lines. Commissioners of water quality, air pollution, solid waste, pesticides, and radiation headed these. Figure 2 illustrates EPA's initial organization. EPA's field organization bore the stamp of the Nixon administration's decentralization policy--''New Federalism." Each of its ten regional offices mirrored the organization of EPA headquarters. In theory, they would be more responsive to constituent needs as a result of their placement around the country. Moreover, their locations would infuse their analysis with a better understanding of regional problems and enable them to account for local priorities in enforcing pollution abatement statutes. Ruckelshaus expected the regional offices to act as the agency's cutting edge, using them to collect the pollution information by which headquarters set national criteria. In cases where major industries or municipalities refused to comply with the law, local officials would identify them, gather evidence, and refer cases to the Justice Department for prosecution. Ideally, the staff at EPA headquarters in Washington would ride on the shoulders of strong regional offices. Ruckelshaus launched the second phase of his reorganization strategy late in April 1971. During the first five months of agency operations, the planning and management staff at headquarters had juggled the tasks of delegating initial responsibilities and preparing for the second restructuring. Phase two consolidated the five medium offices into two new entities headed by assistant administrators. The Office of Media Programs incorporated the water and air programs. The Office of Categorical Programs subsumed the separate pesticides, radiation and solid waste management offices. Again, each of the regional offices conformed to the change. Figure 3 illustrates the new relationships resulting from this restructuring. The agency never implemented the third phase, which would have eliminated the medium-oriented program offices altogether. In the heat of the pollution enforcement battle, neither Ruckelshaus nor his successors had the time, resources, or even the inclination to restructure the agency along completely functional lines. Over time, as new environmental legislation or changing national priorities subtly modified the agency's mission, EPA's organizational tree continued to grow, but never beyond the confines of the second phase. Ruckelshaus realized that the organizational changes required to put Alain Enthoven's functional theories into effect would divert too much energy from performing the agency's broad, public mandate quickly and effectively. Hindsight suggests that not doing so doomed the agency to periodically rehashing the unsolvable functional versus medium specific organizational question in its efforts to accomplish its broad mission effectively and efficiently. The Armco plant on the Houston Ship Channel was the site of one of EPA's first major confrontations with corporate pollution. Ruckelshaus sensed that agency credibility was far more important than the abstractions of organization, and action established credibility. He believed that swift enforcement action against big cities and big companies would demonstrate EPA's willingness "to take on the large institutions in society which hadn't been paying attention to the environment." 2 By doing so, he would start building strong public support for the agency. Seven days after taking the helm at EPA, Ruckelshaus delivered a speech before the annual Congress of Cities--a meeting attended by U.S. big city mayors. To a dismayed crowd of city officials, Ruckelshaus announced that EPA was at that moment serving the cities of Atlanta, Detroit, and Cleveland with formal "180 day notices" that directed them to stop violating federally sponsored state water quality standards. Notoriously polluted, these cities had fallen chronically behind on previous commitments to federal and state officials to stop spilling pollutants into neighboring waterways. Tempered by his experiences with the Indiana Board of Health, Ruckelshaus preferred to use the Department of Justice's big stick as a last resort, hoping that maneuvers such as six-month warnings for municipal violators would encourage them to act in good faith. Ruckelshaus and his staff did not devise their enforcement strategy in a vacuum. Complex social forces defined the possible approaches the agency could take toward environmental law enforcement. In order to fight the war in Vietnam and the war on poverty at home during the 1960s, the Kennedy and Johnson administrations had adopted a centralized approach to government. By 1968, many Americans were tired of it. Building on that sentiment, the Nixon administration emphasized decentralized management. In turn, the Nixon-appointed EPA administrator hoped EPA could "work in concert--in a relationship of mutual concern and responsibility" with regard to state and local pollution control initiatives. 3 The agency would take enforcement initiative only when municipal and state governments found themselves stuck in "the logjam of inertia." 4 It would act as a "gorilla in the closet" for the cities and states to use to frighten polluters into submission. State regulators had long wished for a federal agency to play this role. Despite this cooperative rhetoric, EPA's relationship to state and local governments started off turbulently and stayed that way. As in the cases of Atlanta, Detroit, and Cleveland, governments often found the "gorilla" threatening them for their own shortcomings. Furthermore, the agency's very existence stood as a federal reproach to perceived state inactivity or ineffectiveness in responding to public demands for cleaner air and water. Cleveland Mayor Carl Stokes's reaction to the 180 day notice typifies local suspicions of EPA motives. Stokes accused Ruckelshaus of making a politically motivated assault on Democrat-controlled cities. As Ruckelshaus predicted, EPA's moderate enforcement strategy shocked and angered the municipalities and states with the worst records of environmental pollution. Ruckelshaus rode the crest of favorable public opinion, though. He used such support to override criticism and to dislodge intransigent polluters. From it, he drew the courage to level the agency's firepower against industrial polluters. Many American industrialists hoped that President Nixon's call to deregulation would result in an era of loose oversight. To their surprise, industrial polluters found EPA dusting off the 1899 River and Harbors Act and threatening them with the broad federal powers provided therein even as Congress considered new and tougher legislation. As a result, in its first year, EPA referred 152 pollution cases--most of them water related--to the Department of Justice for prosecution. Despite his inclination to use the courts only as a last resort, Ruckelshaus discovered that the magnitude of the pollution problem quickly exhausted less threatening options. During the 1960s, as public pressure to cleanse the environment increased, many large companies found themselves negotiating with state pollution control agencies. In order to comply with state and federal standards, these firms agreed to treat their effluents. Company attorneys and state officials negotiated incremental compliance schedules designed to allow plants enough time to take agreed upon actions without imposing undue financial burdens. Many companies recognized that states had neither the power nor the inclination to enforce these agreements and therefore took little or no action to meet the timetables. Ruckelshaus knew that EPA's effectiveness depended on forcing the most intransigent businesses to take responsibility for the wastes they produced. 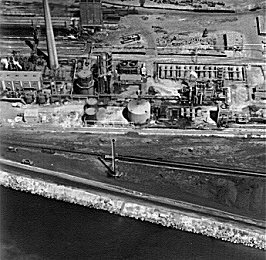 In one of the first struggles to discipline big industrial polluters, Ruckelshaus engaged Armco Steel. In mid September 1971, nine months after EPA referred its case against Armco to the Justice Department, a federal district court judge found Armco guilty of dumping over half a ton of toxic chemical--mostly cyanides and phenols--and between three and six tons of ammonia into the Houston Ship Channel daily. Over several decades this activity resulted in numerous fish kills and the close of shell fish beds in Galveston Bay. Because of the toxicity of these releases, the court ordered Armco to halt all releases into the channel. The company faced closing its Houston furnaces to comply. Nixon aide Peter Flanagan called in EPA enforcement chief John Quarles and strongly suggested that EPA propose a sixty-day stay of the court order to provide Armco and EPA time to negotiate an amicable solution. Armco upped the ante with the White House by asserting that 300 workers would lose their jobs immediately as a result of the order. To the White House, which was then struggling to disentangle the nation from its commitment in Indochina and avoid (unsuccessfully) the economic whirlpool that drove unemployment figures up from 4.8% in 1970 to 8.9% in 1975, this was a deeply troubling threat. Quarles called Armco's bluff. With another White House aide listening in, Quarles telephoned regional EPA staffers who told them that Armco had planned to lay off the 300 people prior to EPA's action. The White House still pressed for a compromise settlement. Peter Flanagan evidently gave Verity the impression that EPA would agree to a stay; but EPA officials continued to oppose concessions. Just as the affair appeared deadlocked, EPA drew a wildcard that secured its position. The Washington Star revealed that Armco had contributed significantly to the Nixon campaign effort. The Star implied that by negotiating-with Armco and considering a stay of the court order, the administration had allowed inappropriate political considerations to conflict with its duty to protect public health and safety. The Star's expose embarrassed the Nixon administration and forced the administration and Armco to negotiate a squeaky-clean settlement. This resulted in Armco agreeing to follow EPA guidelines for installing proven waste treatment technology at its Houston facility. Nevertheless, Congress still held the last card. Many on Capitol Hill saw in the Armco affair an opportunity to further embarrass the Nixon administration. Congressman Henry Reuss called Peter Flanagan, EPA representatives, and Justice Department officials before his House Government Operations Subcommittee on Conservation and Natural Resources to explain the administration's actions. Reuss suggested that EPA should enforce congressional requirements regardless of the administration's position on the matter. John Quarles, EPA's spokesperson, found himself caught in the long-standing struggle between presidential and congressional power. As an enforcer of the law, EPA was bound by congressional mandates. But as an instrument of the executive branch, the agency also had responsibility to the chief executive. After all, the president held broad constitutional authority to implement enforcement. The Armco incident begged a crucial question: who controlled EPA? Although William Ruckelshaus had received assurances from the White House that he did, the reality was never so absolute. Like his successors, he would find it necessary to determine whether Congress or the president was decisive on any particular issue. Clearly during the Nixon administration's first year, the White House held the reins of power. But as the presidency was shaken first by the Vietnam War and then by the Watergate Scandal, Congress became ascendant in environmental, as in other, matters. This Kansas City photograph illustrates primary air pollution--smoke stack and auto emissions--and secondary pollution--smog and aesthetically irritating highlines poles. By the late 1960s the American public began to demand action on environmental questions. To attract voters, national political figures started to incorporate then-current environmental messages into their campaigns. Senator Edmund Muskie of Maine, chairman of the water pollution subcommittee of the Senate Public Works Committee, was one of the first to recognize the value of this strategy. He sponsored the Clean Air Act of 1967; but under pressure from consumer advocates such as Ralph Nader to improve its effectiveness, he redoubled his efforts. Muskie had keen presidential ambitions, which depended in part on the public identifying him with a popular cause. A real environmental crusader by 1970, Muskie led the 1970 fight for very tough clean air legislation. The resulting Clean Air Act of 1970 made EPA directly responsible for establishing limits on air pollutants and enforcing them. Cleaning the air offered EPA one of its toughest challenges. The agency eased into clean air issues slowly in order to give researchers time to do their work before legislative deadlines forced Ruckelshaus to promulgate air quality standards. He understood that rushed conclusions would eventually discredit the agency's programs. Ruckelshaus also understood that air pollution control was a more complex issue than the enforcement of water quality standards. The differences persuaded him to choose the path of lesser resistance: to emphasize gross water pollution first. Water pollution was an "apple pie" issue. Water standards had existed for many years; air standards were relatively new. Most state governments had possessed water pollution authorities since early in the twentieth century (although they seldom executed enforcement effectively); air pollution control authorities were relatively new. The public mind already easily pictured villainous big companies victimizing powerless, unorganized citizens. It was a short step--made by some nearly a century earlier with regard to scenic landscapes--to add the nation's aquatic ecosystems to this picture. As a result, citizen groups leaped at the opportunity to assist the agency in identifying big industrial polluters. But, air pollution control did not lend itself as easily to traditional tactics of vilification. While people could blame companies for many air pollution problems, many others were caused by the American people's reliance on fossil fuels to power the icons American life--home appliances, lawnmowers, and automobiles. As a result, local groups found it difficult to organize for effective action. Ruckelshaus understood the complexity of the clean air issue. He had helped write Indiana's clean air legislation. He understood that each region had different problems and no one solution would effectively solve all of them. When EPA published its ambient air quality standards in 1972 and began approving state and regional plans to meet those standards, the administrator and the agency faced intense scrutiny from environmental groups, congressmen, the White House, and the industrial community. They represented EPA's constituency and the agency felt some responsibility to all of them. But, in clean air, as with most regulatory efforts, compromises made to satisfy the legitimate demands of so many interested parties resulted in an unsatisfactory outcome. In 1970, people living in smoggy cities wanted clean air--air that did not aggravate respiratory problems, burn the eyes, smell acidic, or restrict visibility. They wanted industries to stop pumping plumes of black smoke out of tall chimneys. They wanted automobile manufacturers to build cars that neither created nor contributed to the smog problem. They wanted clean air immediately and painlessly. In contrast, business and industry wanted time--time to under-stand the rules, to research and develop ways to abide by the rules, and to defer installing pollution control equipment until the economy firmed up. Industrialists also wanted to see whether Congress would stick to its resolve to clean up the air or soften its position. Businessmen postponed investing in pollution control equipment for fear that they would get it half installed and then Congress would be persuaded to change the rules again. With time, they argued, public and economic policies would stabilize and allow them to implement pollution controls. On Capitol Hill, Congress yearned to tip the scales of government power more to its side. The many committees responsible for overseeing EPA's legislative implementation wanted to be sure the agency acted in a manner consistent with congressional intent and public will. Moreover, the political advantage of forcing an agency created by a Republican president to accede to Congress was not lost on House and Senate Democrats. Individually, Muskie and others wanted to use EPA as a vehicle by which they could express their convictions on environmental issues. Congressmen sometimes took the opportunity to gain notoriety and bolster their environmental pedigrees by making hearings with Ruckelshaus and other EPA officials unpleasant and sensational. An array of new interest groups emerged from the broad social ferment of the 1960s. Environmentalists active in the Sierra Club, the Environmental Defense Fund, and Greenpeace adopted strategies similar to those used by other liberal reform groups of the era. Social activists identified victims of perceived institutional oppression, educated them, and then encouraged them to take action. If need be, they went to court on the victim's behalf. In the case of the environment, environmentalists characterized both public health and nature itself as victims. Their lawyers pressed the matter on the courts. Thus, as EPA administrator, Ruckelshaus found himself battered by public advocacy lawsuits forcing him to take more stalwart action in promulgating regulations and enforcing the law. Many of these addressed air quality. Complaints and questions from traditional interest groups also buffeted the agency. Industries associated with targeted emissions questioned the agency's air quality standards by attacking EPA's scientific credibility. Automobile manufacturers demanded extensions of implementation deadlines stipulated in the 1970 Clean Air Act. They asserted that the necessary technology did not exist and could not be developed in time to comply with the main provision of the act--to cut auto exhaust emissions by ninety percent over five years. These external pressures seemed to supercharge the customary competition between and within the government's branches. The White House used the Office of Management and Budget to press agency actions into the administration's policy mold. Ruckelshaus and congressmen traded charges of partisanship as they confronted one another in committee hearings with scores of journalists and television cameras present. The courts acted on lawsuits filed by environmental groups to compel EPA to issue regulations making it illegal for companies to degrade the air in areas where it was cleaner than standards required (Sierra Club v. Ruckelshaus). Supporters of the clean air movement wondered if the 1970 Clean Air Act would ever get off the ground. To the casual observer in 1975 Los Angeles or a number of other metropolitan areas, the government had failed to achieve the act's goal--clean urban skies. However, a more careful observer would have noted that the usual charge of government inefficiency and "gridlock" was only partially to blame for still-smoggy skies. In fact, many of the people identified as victims of air pollution bridled at EPA's attempts during the early 1970s to liberate them from polluted air. Despite nearly 60 percent of those polled claiming to support environmental clean-up without regard to cost, editorials in regional newspapers and indignant state and local officials suggested otherwise when EPA suggested that compliance with the 1970 Clean Air Act's tough standards would require draconian measures in some areas. In L.A., for instance, regional air quality improvement plans almost banned cars. Environmentalists versed in ecology had recognized that when it came to pollution, humans were often victims and villains simultaneously. In the case of urban smog, many of those who complained about the health and aesthetic effects of air pollution commuted to work in the very automobiles largely responsible for the problem. Some environmentalists called for radical social reforms that would direct Americans toward decentralized, low-technology lifestyles. A radical solution to the smog problem along this line would have demanded a nearly total reorientation of the urban work place. Instead of workers commuting to centralized office buildings, companies would establish small satellite offices in suburbs to which workers could commute on foot or bicycle or perhaps some employees could perform their analytical tasks in a home office. Such solutions threatened the very fabric of the centralized American industrial culture that had replaced the home and community based work culture common in America only 150 years earlier. Public reaction to the much more moderate proposals worked out by EPA suggested that many people were not as willing to pay the price for clean air as opinion polls suggested. After much consultation with state and local officials, Deputy Administrator Robert Fri promulgated clean air regulations for L.A. that he suggested would probably not achieve mandated congressional air reduction goals, but would begin the process by which that goal would ultimately be met. The regulations mandated yearly automobile inspection and maintenance, the creation of restricted bus and carpool lanes on major streets and highways, gasoline allotments to distributors based on 1972 consumption, and new parking development restrictions. Some critics complained that mandatory inspection and maintenance would inequitably strike the poor and working class harder than the more wealthy and others pointed to the tremendous costs entailed by increasing bus fleets. But, the criticism receiving the most play in the press concerned parking regulation. The transportation plan forced parking lot builders to apply for development permits in a manner reminiscent of the water pollution permit system administered by EPA and the Army Corp of Engineers. More controversially, it proposed a surcharge that by 1976 would amount to $450 per space per year on more than 90,000 downtown Los Angeles parking spaces. Reaction to the surcharge intensified throughout late 1973 and 1974. Businessmen and labor leaders joined to protest federal rules that they claimed "would do more than make it intolerable for people who drive cars to work." Local officials responded to public outcry by trying to develop their own transportation plan that would demonstrate the Los Angeles basin's intent to comply with Clean Air Act mandates, but buy time to balance automobile traffic restrictions with the expansion of public transportation. Representatives responded to the negative public reaction to parking proposals by supporting California Democrat John E. Moss's emergency energy bill amendment to suspend EPA transportation regulations. The popular affirmation of the "freedom to drive," which Economist Paul Samuelson claimed EPA would abridge or eliminate with its transportation controls, ultimately forced the agency to back away from implementing parking controls. Faced with having to make hard sacrifices to achieve pollution reduction, many people lashed out at measures they believed to be too intrusive. They seemed to object especially to the ones that threatened the existence of the material icon of the late twentieth century--the automobile. For many, it came down to a decision between personal liberty and clean air, and the desire for personal liberty overrode concerns for clean air. Throughout American history, Americans have bristled at government attempts to restrict personal action. The political philosophy developed by Thomas Jefferson and others at the nation's creation institutionalized the individual liberty ideal into American political thought. The frontier myth defined self-sufficiency as the predominant virtue. Frontier people perceived the government regulation that attended government aid as hampering their ability to prosper. During the nineteenth century, Americans thinkers, such as Ralph Waldo Emerson, Henry David Thoreau, and Mark Twain, glorified individualism. In the twentieth century, conservative politicians, such as Herbert Hoover, Dwight Eisenhower, and Ross Perot, idealized self-help individualism. Between the 1950s and 1980s, some conservatives pointed to the communist threat to individual freedom in an effort to direct government spending toward national defense and away from domestic regulation. With a constant thread of individualism woven through the American social fabric, it is little wonder that the strict regional planning approach failed -especially when city councils and newspaper editorialists communicated the effects it would have on individuals in the form of taxes, user-fees, and access to public places. 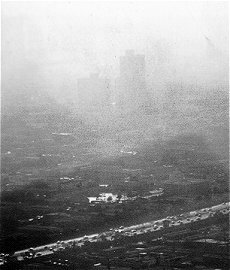 Smog obscures buildings in West Los Angeles, May 1972. Still, the less personally painful aspects of the Clean Air Act of 1970 survived through the negative reaction to these intrusive proposals. Despite their opposition to regulation, automobile manufacturers still had to build cleaner cars and big businesses had to scrub pollutants from their air emissions. By 1973, EPA and auto manufacturers had agreed to adopt the catalytic converter as a means to reduce automobile emissions by 85% in 1975 year model cars. While thus figure fell a little short of Clean Air Act goals, the solution satisfied most car makers, EPA officials, and citizens whose concerns about clean air had been diverted, ironically, by a more fundamental concern: having enough gasoline to keep cars on the road. By 1974, EPA officials estimated that industrial sources belched 14% less dust, smoke, and soot and 25% less sulfur dioxide from their chimneys than in 1970. Neither the number of automobiles nor the number of tall industrial stacks declined during the early 1970s, but the quantity of pollutants they emitted did. In this partial success, EPA found reason to celebrate. The clean air issue reinforced Ruckelshaus's view that EPA's effectiveness depended on popular support. When the electorate broadly supported EPA's mission, politicians could not stymie the agency's long term efforts. For the same reason, industry had to walk the fine line between trying to protect profits and appearing greedy and obstructionist in the eyes of voters and consumers. "You've got to have public support for environmental protection or it won't happen," asserted Ruckelshaus. 7 He had rediscovered the lesson learned by environmental managers nearly a century earlier in the Forest Service. If it was to rely on popular support for its power, EPA had to be willing to compromise on divisive issues and accept mixed results in meeting initial goals. Unlike the air controversy, which erupted after the agency's establishment, EPA's creation coincided with the culmination of the public debate over DDT (dichloro-diphenyl-trichloro-ethane). A chlorinated hydrocarbon, DDT proved to be a highly effective, but extremely persistent organic pesticide. Since the 1940s, farmers, foresters, and public health officials sprayed it across the country to control pests such as Mexican boll weevils, gypsy moths, and pesky suburban mosquitos. 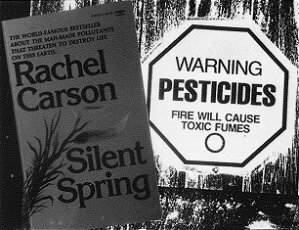 Widespread public opposition to DDT began with the publication of Rachel Carson's influential Silent Spring. Reporting the effects of DDT on wildlife, Carson demonstrated that DDT not only infiltrated all areas of the ecological system, but was exponentially concentrated as it moved to higher levels in the food web. Through Carson, many citizens learned that humans faced DDT-induced risks. By 1968 several states had banned DDT use. The Environmental Defense Fund, which began as a group of concerned scientists, spearheaded a campaign to force federal suspension of DDT registration--banning its use in the United States. Inheriting Department of Agriculture (USDA) pesticide registration functions, under the Federal Insecticide, Fungicide, and Rodenticide Act (FIFRA) of 1964, EPA was born in the midst of the DDT storm. In January 1971, a tribunal of the U.S. Court of Appeals in the District of Columbia ordered Ruckelshaus to begin the process of suspending DDT's registration, and to consider suspending its registration immediately. At the end of a sixty-day review process, the administrator reported that he had found no good reason to suspend DDT registration immediateIy. It and several other pesticides--including 2, 4, 5-T (Agent Orange), Dieldrin, Aldrin, and Mirex--did not appear to constitute imminent health threats. This action infuriated many environmentalists. By 1971, the Environmental Defense Fund had mobilized effective public opposition to DDT. The furor created by Ruckelshaus's refusal to stop DDT use prompted many to look for sinister political motivations. Some suggested that Mississippi Congressman Jamie Whitten had used his position as chairman of the agricultural appropriations subcommittee of the House Appropriations Committee to make Ruckelshaus conform to the interests of the agrichemical lobby. While actually, Ruckelshaus took his cautious stance for less menacing reasons. At its creation, EPA not only inherited the function of pesticide registration from USDA, but also the staff that served that function. The USDA economic entomologists who designed the pesticide registration process in the first place preached the advantages of effective pesticides and minimized discussion of debatable health risks. The same staff that had backed USDA Secretary Clifford Hardin's earlier claim that DDT was not "an imminent hazard to human health or to fish and wildlife" 8 provided Ruckelshaus with the same counsel. Rachel Carson's Silent Spring led to banning DDT and other pesticides. Between March 1971 and June 1972, American newspapers reported both sides of the pesticide debate. Some articles recalled the glory days when pesticides saved thousands of lives in World War II; how they had increased agricultural productivity and allowed relatively few farmers to feed the world's growing population; and how the most besieged insecticides, such as DDT and Mirex, had little human toxicity. Other journalists praised alternative approaches to pest management such as biological controls (predator introduction, sterile males, and pheromone traps), integrated controls (crop rotation and carefully delimited pesticide use), and refinement of other, less persistent chemicals. Some reported the near panic of Northwestern fruit growers facing beeless, and therefore fruitless, seasons. They attributed the lack of pollinating insects to pesticide use. Throughout the spring of 1972, Ruckelshaus reviewed the evidence EPA had collected during the agency's hearings on DDT cancellation and the reports prepared by two DDT study groups, the Hilton and Mrak Commissions. Both studies suggested that DDT be phased out due to the chemical's persistent presence in ecosystems and noted studies suggesting that DDT posed a carcinogenic risk to humans. In June, he followed the route already taken by several states he banned DDT application in the United States. Though unpopular among certain segments of EPA's constituency, his decision did serve to enhance the activist image he sought to create for the agency, and without prohibitive political cost. The DDT decision was important to EPA for several reasons. While it did not stop the debate over what constituted appropriate pesticide use, DDT demonstrated the effect public pressure could have on EPA policy decisions. It also made very visible the tightrope act a regulatory agency performs when it attempts to balance the demands for protection of human and environmental health against legitimate economic demands. Furthermore, EPA's decision set a precedent for regulatory decision-making. As an advocate of the environment, Ruckelshaus and the agency chose to risk erring on the side of protecting human health at the expense of economic considerations--a course that would bring the agency under heavy criticism before the end of its first decade. Administrator William D. Ruckelshaus introducing his successor, Russell E. Train, at a 1973 press conference. William Ruckelshaus would not have to bear that burden; it would fall to his successors. In 1973, as the Nixon administration broke up in the Watergate storm, Ruckelshaus agreed to become acting FBI chief and then the Deputy Attorney General before resigning along with Elliot Richardson in the "Saturday Night Massacre." Russell Train, the Chairman of the Council on Environmental Quality (CEQ), succeeded him as head of EPA. Train would see the first significant reversal in the environmental movement's fortunes as inflation, unemployment, and the energy crisis forced the nation to re-prioritize its goals. Train became head of an agency with credibility and an activist image. In the area of water pollution, its efforts forced industries and municipalities to take responsibility for their wastes. EPA became a "gorilla in the closet" for local and state enforcement officials. Sometimes the gorilla became a formidable adversary of states and municipalities when it targeted them for enforcement. In its effort to clean up city skies, the agency successfully encouraged clean air technology development. 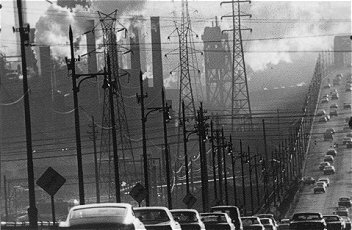 It also forced the American public to face the personal cost of pollution prevention--a cost considered too dear by many in the 1970s. Upon encountering conflicting scientific opinions regarding toxic chemicals in the environment, EPA policy makers chose to minimize the potential, long-term injury to environmental and human health at the expense of concerns that had figured prominently in traditional decision-making equations. EPA developed a strong, diverse constituency that enabled it to continue to direct national policy in a manner consistent with its mission--to protect the environment by abating pollution and thereby enhance the quality of American life. Dunlap, Thomas R. DDT: Scientists, Citizens, and Public Policy. Princeton University Press, 1981. Hamby, Alonzo. Liberalism and Its Challengers: FDR to Reagan. New York: Oxford University Press, 1985. Hays, Samuel P. Beauty, Health, and Permanence: Environmental Politics in the United States, 1955-1985. Cambridge: Cambridge University Press, 1987. Conservation and the Gospel of Efficiency: The Progressive Conservation Movement, 1890-1920. Cambridge, MA: Harvard University Press, 1959. Lacey, Michael J., ed. Government and Environmental Politics: Essays on Historical Developments Since World War Two. Washington D.C.: The Woodrow Wilson Center Press, 1991. Landy, Marc K., et. al. The Environmental Protection Agency: Asking the Wrong Questions. New York: Oxford University Press, 1990. Lovins, Amory. Soft Energy Paths: Toward a Durable Peace. San Francisco: Friends of the Earth, International, 1977. Melosi, Martin. Garbage in the Cities: Refuse, Reform, and the Environment, 1880-1980. College Station: Texas A & M University Press, 1981. Nash, Roderick Frazier. The Rights of Nature: A History of Environmental Ethics. Madison: University of Wisconsin Press, 1988. Quarles, John. Cleaning Up America: An Insider's View of the Environmental Protection Agency. Boston: Houghton Mifflin Company, 1976. Shabekoff, Philip. A Fierce Green Fire: The American Environmental Movement. New York: Hill and Wang, 1993.
intermedium: EPA defines media as air, water, and land collectively. "Media" is the plural form of medium--a substance regarded as the means of transmission of a force or effect. many committees: By 1993, EPA answered to 13 major Congressional committees and 26 major subcommittees. 1. Administrator to EPA Staff, 4 Dec 1970, Memorandum, Administration and Management files, EPA Historical Collection. 2. EPA History Program, "William D. Ruckelshaus," EPA Oral History Series (United States Environmental Protection Agency, November 1992), p. 9. 3. William D. Ruckelshaus, Address to the Indiana State Legislature, 8 February 1971, Ruckelshaus' speeches file, EPA Historical Collection. 4. William D. Ruckelshaus, "The City must be the Teacher' of Man; Address to the Annual Congress of Cities, Atlanta, Georgia, 10 Dec 1970. 5. William Verity to Richard Nixon, 28 Sept 1971, in John Quarles' Cleaning Up America: An Insiders' View of the Environmental Protection Agency (New York: Houghton Mifflin, 1976), pp. 63-4. 6. EPA Oral Interview-1: William D. Ruckelshaus, Interview conducted by Michael Gorn (Washington, D.C.: GPO), pp. 10ff. 7. Ruckelshaus interview, p. 8. 8. Thomas DunIap, DDT: Scientists, Citizens, and Public Policy (Princeton University Press, 1981), p. 208. Special thanks go to Dr. Richard Baker, Dr. William Cronon, Dr. Dan Flores, Dr. Michael Gorn, Dr. George Watson, and Don Bronkema for their helpful comments on drafts of this document.